FAITH, S.D. 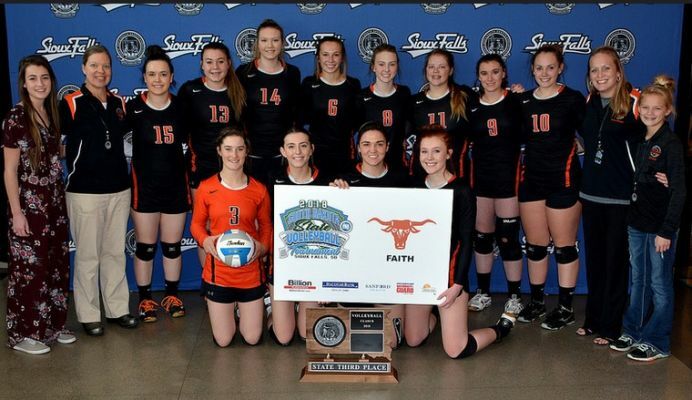 - Faith rebounded from their loss to Northwestern on Friday and beat Chester in four sets to place third at the Class B State Volleyball Tournament Saturday. Faith won the first set 25-19, but saw Chester pick up a 26-24, hard-fought second set. Faith rebounded with a 25-19 third set win and put it away in the fourth set with a 25-18 win. Brooklyn Hanson had a great game for Faith, scoring 33 digs Sydnie Schauer added 24 digs. Mikenzy Miller had 16 kills for the Longhorns and Aiyanna Bird added an additional 15 kills.